is pleased to offer a wide range of recombinant proteins labeled with stable isotopes through expression in E. coli, Yeast, Sf9 (Baculovirus) and Mamalian cells. 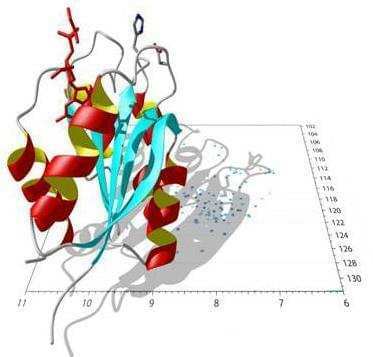 In addition to the proteins shown on the catalog, we have also established a unique platform of for custom isotope labeling service for novel proteins. We are specialized in labeling proteins with stable isotopes, typically 13C, 15N, 2H, or a combination of 15N and 13C. All Creative BioMart's isotopic labeled products undergo a strict quality control process including mass spectroscopy and NMR . Our scientists have extensive experience in isotopic labeling of proteins and, we have produced contracted over 500 contract protein production projects with an overall success rate of 90 %. We are proud of on our track record for one-time delivery. We believe that Creative BioMart is your ultimate choice for isotope labeling of recombinant proteins. With years of experience in bacteria culture and protein expression, scientists at Creative BioMart have developed a fortified minimal medium supporting the growth and protein expression that is comparable to the regular medium. This proprietary medium drastically lowers the cost, providing a large amount of recombinant protein uniformly labeled with a stable isotope . Creative BioMart has developed a variety of labeling approaches to meet all your needs. Our NMR laboratory is equipped with exceptional NMR instruments and to provide structural analysis on isotopic labeled proteins. This Accurate NMR structural analysis will be done after the appropriate isotope labeled proteins have been produced and purified on scale.